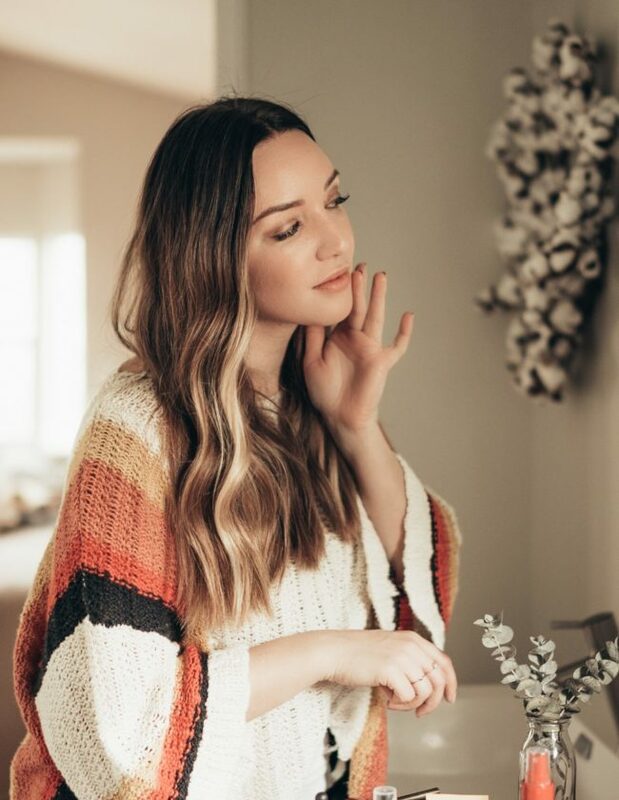 Hey guys…my latest roundup of fun things that I’m loving as of late…enjoy! I’m hosting a ‘friendsgiving’ this year (Thanksgiving celebration with friends, before seeing my family) and I’m already on the hunt for creative and new food ideas to share with my guests. 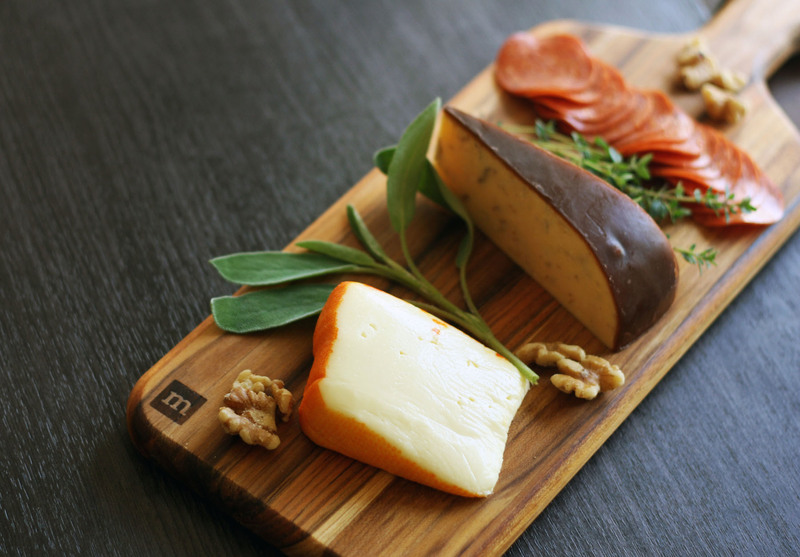 I like the idea of going less traditional and doing small bites instead of a full sit-down dinner and I’ve been getting so much inspiration from the new blog Avec Mallory–especially this amazing cheese plate! Mallory’s photography is just too good. 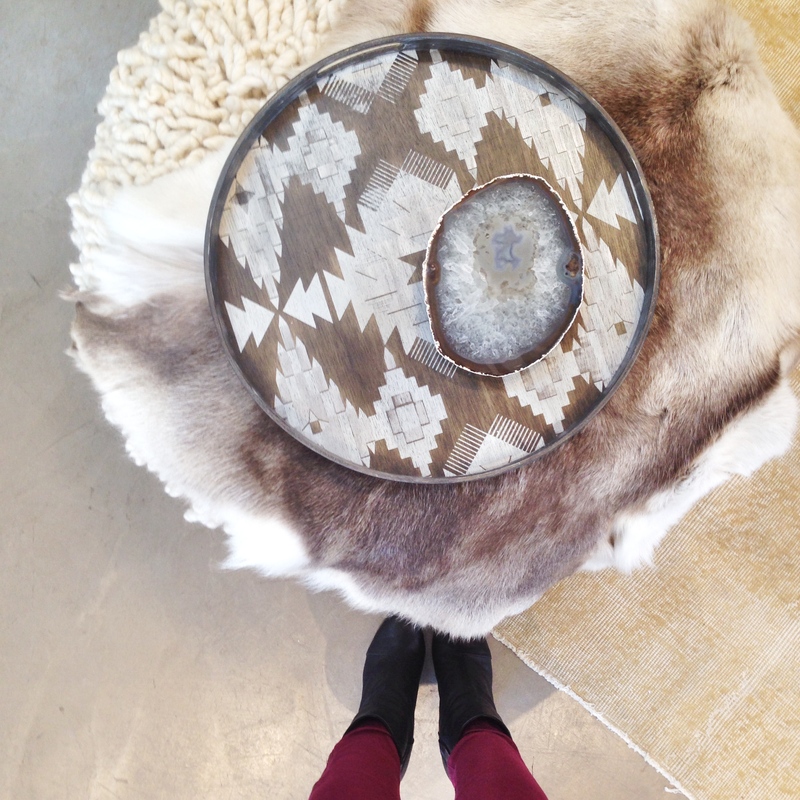 This past weekend I checked out the Calypso St. Barth boutique in Larkspur, CA and it is one of the most beautifully curated stores I’ve ever seen. I didn’t realize they had home goods (in addition to the wonderful clothes) and there are so many pieces that I want to bring into my home. Their creamy neutral palette is so pretty, it makes me turn all heart-eye-emoji…haha! I love fashion that gives back and I’m excited to be attending the upcoming charity gala The Taste of Stars benefiting the UCSF Benioff Children’s Hospital Cancer Program on Thursday September 25th, 2014. Some of the best San Francisco couturiers will be showcasing their latest designs, delicious food and drink, and live music! 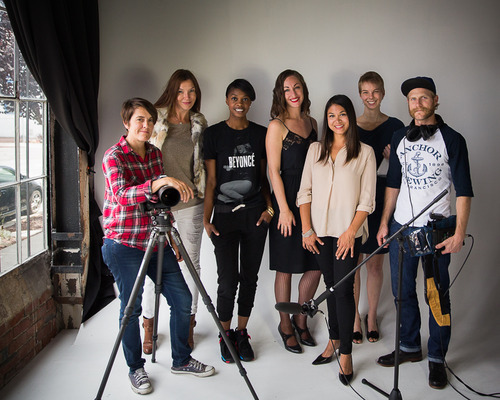 It’s going to be a great event to support local designers and help children in need. If you’re in the bay area, would love for you to join me at the event! You can get your ticket here..but now I need to figure out what to wear..Hmmm. 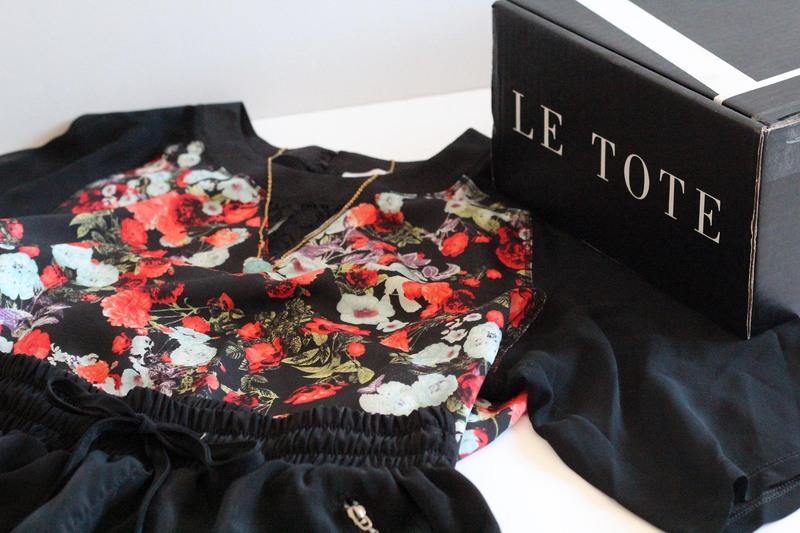 Have you guys heard of / tried Le Tote? I recently signed up for the subscription service and I’m pleasantly surprised! Being a native San Franciscian, I love trying out and supporting local startups and I’m glad I tried Le Tote. I’ve been really impressed with the perfectly curated boxes of clothing and love the concept of “Netflix for women’s fashion”. You’ll definitely be seeing more from Le Tote on Just Add Glam soon! New York Fashion Week has come and gone (did you see my NYFW post?) and now its time for London Fashion Week! Naturally, London Fashion Week runway hair is being covered by none other than London-based TONI&GUY and I’m already seeing some amazing styles come out. Since I’m having major FOMO from not being in London, I stopped by ULTA and picked up the three TONI&GUY styling collections that they are using backstage so I can try my hand at runway styles too (so so so many braids…you’ll see soon enough!) The collections include casual, classic, and glamour and help make runway style more achievable! A perfect addition to any stylish wardrobe, I say! 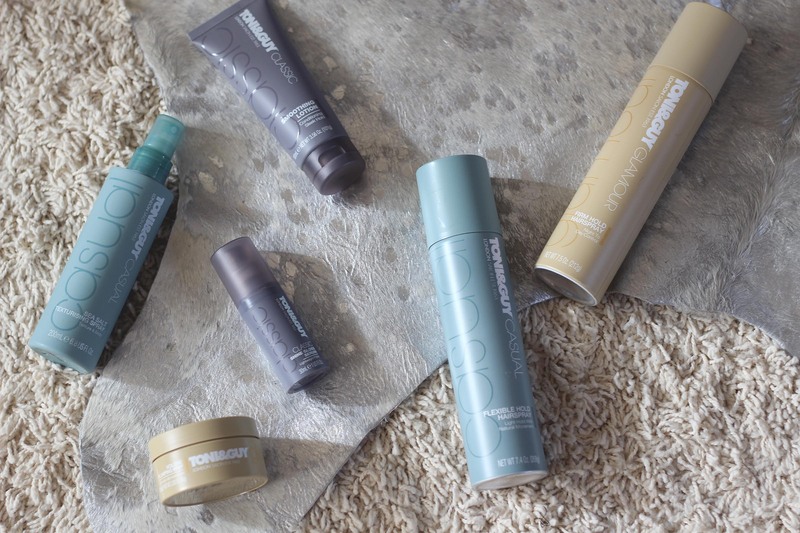 Okay guys, I can’t hold it in any longer…to celebrate London Fashion Week and TONI&GUY rocking runway hair, my friends over at ULTA are hooking up a lucky Just Add Glam reader with a $50 ULTA giftcard and TONI&GUY products! What can I say…fashion month gets me so excited so I figured we needed to celebrate! Entry is easy via the rafflecopter widget below…good luck! Style starts with your wardrobe, but it ends with your hair. This September, perfect your look by bringing it all together with TONI&GUY at ULTA. We’re offering 3 new collections to complete your style — Casual, Classic and Glamour — plus a free cosmetic bag with full-size TONI&GUY product purchase. 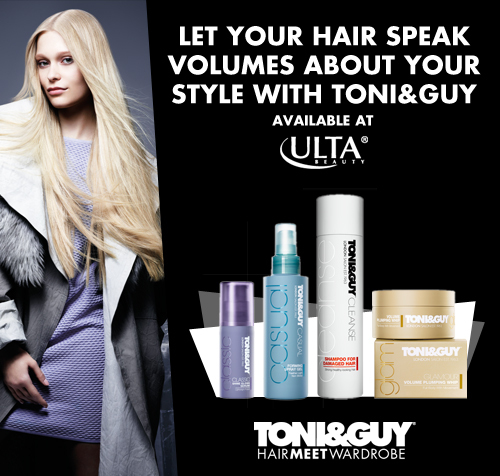 Visit an ULTA near you, and put the finishing touch on your style today only with TONI&GUY. Available until 9/27, while supplies last. well, for the Toni&Guy hair product, I think my tween daughter and myself would have a blast using it since we’ve never tried this brand, but I’m a big fan of mousse and hairspray and of course she is into styling her hair so I’m sure she will also use their product. From Ulta I can see us trying out the NOT YOUR MOTHER’S Clean Freak Dry Shampoo, and some Urban Decay and Bare Minerals lipsticks/lipgloss. i would definitely love my hair to have some volume! so it will look thicker! Id use the $50 dollars for a new outfit and a make over! I would love to try the Toni & Guy Prep Heat Protection Mist. I use a straightener everyday and really need something to protect my hair from the heat damage. Their products sound wonderful! I would use the Ulta gift card to buy some new make-up for the fall. I would actually give it to my Mom. She’s a teacher who works hard and deserves a fun treat! I would use the Toni & Guy products to add volume to my hair and I would use the Ulta GC for buy some BareMinerals makeup for myself! With the hair product, I am growing my hair out from a pixie and it is NOT fun. I, thankfully have a 11 yr old daughter that has amazing talents and she is able to do some braids and amazing styles in my hair and this would be perfect. The 50$ I would buy her some lip gloss for a “thank you” and also some products for my skin since being on HRT at 34 due to surgical hysterectomy from serious female problems. My skin has gone down the drain and my confidence with it. I would use this to buy myself a new outfit! If I won, I’d gift this to my niece. She is an ULTA nut! I would use the hair product to nourish my frequently dyed hair and I’d split the gift card between my mom and I – we both have had our eyes on a few things! I have never bought Toni & Guy products, I would love to try it for my natural curls. For the gift card, I would purchase new makeup! I would get new eyeshadow and blush, and I would treat my dry hair. I would try and tease my bangs with the hair spray and use the gift card to buy perfume. I love Toni & Guy products and have gone there to there Salon in Newport for over 20 years to have my hair cut. At Ulta I would buy some new foundation and something from Smashbox too. I would use the Toni & Guy product to moisturize and protect my hair from frequent blow drying/straightening and I would use the Ulta giftcard for eyeliner and lipstick. I would use the ULTA card for some nailpolish shoppin’ 🙂 Thank you! I would use the hair products to give my hair some volume and I would get nice lipsticks with my GC. I have not used T&G products but I would use the Ulta card to get something to make my skin clearer and more even toned. my favorite right now is NYX lip butter. I would use the Toni & Guy hair product to try to give my hair some volume and curls (stick straight hair here). I would use the GC on some marc jacobs dot perfume! I would use the hair products for myself, I love to keep my hair looking good! The gift card would be for my daughter that spends half her paycheck on makeup! Thanks for the great giveaway! I’d be looking for curl enhancing products or volumizing products from Toni & Guy and would use the GC at the Ulta salon for a great haircut. I would give the gift card to my mom to treat her well. She has done so much for me! I would use the gift card to purchase some Philosophy bath product and also some new fall Essie nail polish colors! I would use the hair products to fight the frizz. I would the gift card for makeup. I have short hair and I always like using new products to help keep it funky and in place. The Ulta card would be nice, I need to get a good hair conditioning oil. I wish Ulta carried Bumble and Bumble and I’d settle for Wen. Or maybe a good foundation, lipsticks and eye liners. I need volume!! And I’d get eyebrow kit to keep on on trends and tame these beasts! I would use the Toni&Guy product to attempt a glamorous runway, wearable hairstyle. I would use the giftcard to purchase new makeup. I just love trying new products and Ulta is a great place to do just that! I love Ulta. I have never used Toni & Guy products before.. but would love to try them out. I would use the gc to buy a Naked 3 Urban Decay palette. I have a teenaged daughter who is experiencing the joys of being a poor college student. I would give her the prize which I am certain she would just relish. I need some serious volume. I would love to get the naked 3 palette. I would use this to get some hair and nail products, and would love a product that helps with frizz. I’ll use the gift card to get eye cream.Toni & Guy Classic Shine Gloss Serum is my favorite product to take care of my messy dry hair. I would give the hair products to my granddaughter.And at Ulta I would get some new Bubble Bath,I love the ones that they put out! Gosh it would be awesome to win this…at Ulta, I would buy the new Bare Minerals liquid make up and brush…I’ve really wanted to try them….I’ve never used Toni n Guy products but would love to try the flexible hair spray. I really need to use better hair products and get more with the $50. My hair has been going through some serious changes as I’ve been getting older. My daughter’s curls could use more definition and less frizz. We would use the gift card to get some new makeup. Thank you! I would let my sister try the new hair product, and I would buy nail polish with the gift card! I try the Toni&Guy products and give the ULTA card to my sister. I would love to try the Toni & Guy Prep Heat Protection Mist. I use a straightener everyday and really need something to protect my hair from the heat damage. Their products sound wonderful! I would buy the bare minerals bare skin liquid makeup and I have never tried the Toni N Guy products, but I would love to try it! Thanks for the giveaway. This is for my beautiful daughter,thanks for the chance. If I won this giveaway, I would totally keep both for myself. The Toni & Guy product because I love their stuff and I would use the Ulta gift card to buy makeup, probably something from the Naked Collection by Urban Decay. I’d gift the hair products and use the ulta gc on a new hair straightener! I would like to try Toni & Guy curly hair products. I would then spend the $50 on hair product and red carpet nail polish. I would love to try the Toni&Guy Prep Leave In Conditioner to tame frizz and make my hair more manageable. I would use the Ulta gift card to buy skin care products. I would keep it all for myself hahahahahahahaha! I’m going to be honest because I haven’t tried any Toni & Guy products – YET, but I love new hair products and can’t wait to experiment! As far as the ULTA gift card, I already know what I’d buy – new Marvelous Moxie lip glosses. I would love to finally find a hair care product to manage frizzy, dry hair!!! I’d love to try their styling products for my wild hair. At Ulta, I would get some perfume and lipstick! I’d learn a new way to style my hair. And I’d buy OPI nail polish and nail strips. My hair is in dire need of a new and refreshing routine, and the Toni & Guy hair products would be perfect for that! I’d use the Ulta gift card to buy the Urban Decay Vice make-up palette. I would give the card to my daughter. She can decide which other products she would like. We both love Ulta products. I have been going there for years. I am not familiar with Toni & Guy products, but I can use volume, and curl for my hair. Thanks for offering these! Wonderful Giveaway! I’d probably spend it on polish! I usually do. I would use the toni&guy products for datenight! & the card to get make up brushes! I need all the help I can get with my hair. : ) At ULTA, I would buy some perfume since I just ran out of my “signature” scent. I think my mom and I would try the hair products and I might use the gift card to buy Christmas gifts. I have never been to Ulta so I would have a blast shopping there with the $50! For the hair products, I would share with my daughter. I kind of don’t do anything with my hair but keep it pulled back in a ponytail so with these products, I can have some fun and actually style my hair and do something fancy and elegant. With the Ulta gift card, I would use it towards to buying Marc Jacobs fragrance and some eyeshadow or lip gloss. I would get my hair done and buy more makeup what else? lol. My daughters would share too of course. I would use the hair product for a date night and I would update my makeup at Ulta! Between Toni & Guy and I the three of us should be able to beat my hair in submission. With Ulta I am think we can make me look fierce. Beautiful hair and gorgeous skin and eyes with glowing cheeks. Failing that I would like to look presentable with a pop of vampy autumnal color on my lips. I would really love to have fuller and shiner hair! There are some great products out there that I would love to try! I love Ulta, I am in need of some fake up concealer! It would be my first time trying the hair product, and for the gift card, I would use it towards some good skincare products. I would use both for myself and the ulta just for makeup. I would buy eye shadow and nail polish from Ulta and I would use the Toni and Guy product to treat my dry hair. I would use the gift card to buy the Ed Hardy Women’s Coffret fragrance gift set for my daughter. I would use the Toni and Guy hair product to give my hair texture, and I would buy some new makeup with the Ulta card; thanks for the giveaway. Would love something to tame my flyways, and some new makeup! I would use this gift card to buy some new Urban Decay makeup. I would get the H2O PLUS Oasis Daily Hydration System with the gift card. I would love to use the Tony & Guy product to help manage the frizz I get when I curl or straighten m hair. I would use the hair product for myself, and I would get the Lorac Pro 2 Palette with the gift card! Hot Head 1875 Watt Pink Hair Dryer. I would have to walk around the store. It’s been a while since I’ve made my wish list in there! I would love to find products that would enhance the vitality of my hair and I would love a new bottle of nail polish…..or two! i would have gifted to my mom,her birthday is coming up. I’d love to try the Toni and Guy for my colored hair. And with the gift card – I’d go crazy buying makeup! My hair is straight as a board – I would use the Toni & Guy product to help give my hair a little volume. I would use the Gift Card to get some facial cleansers and moisturizers. I would stock up on Stila at Ulta and then get all prettied up for a big wedding! I cut some inches off my hair so i’d really do up the natural wavy look with the products and letting it air dry. I love Ulta though it’s 60min from me and I buy all beauty aids there. I would use the hair product & share the GC with my daughter. Id get my hair done, Im overdue for that. The Toni & Guy will be used for me and my hair needs it! My hair is salon quality and my budget is drugstore (with a coupon). The ULTA card will go toward my passion… good perfume. thanks for the giveaway! The hairspray and the BED HEAD. I’d love to try the hair products, since I’ve never tried Tony & Guy’s! And I went to Ulta with my step mother in law the other day for the first time! Wow…so many great products in there! I’d love to put the gift card towards one of their perfumes…there were a couple I fell in love with! I’d get some new makeup with the GC! And I’d like to try the Smoothing Lotion! My hair definitely needs some TLC and I would love to get some new makeup from Ulta, an eyeshadow palette would be amazing! I would use the hair products on myself and use the gift cards towards gifts. I would give the hair products to my sister who has long frizzy hair, but I would treat myself to a new straightener with the Ulta gc! My daughter and I love to go to Ulta! Thanks for the chance, we love to shop all the makeup and brushes and purchase what we are in need of! We are always up for new eye shadows, pallettes, something new and fun! Thanks for the giveaway! I would stock up on some great face wash. I would give the hair products to my daughter. She colors her hair, and is always looking for new products to keep it looking good. I would use the gift card myself and get some Amazing Grace perfume from philosophy. I love ULTA so I I would buy Urban Decay Vice 3….its my new Fav item. Also for Toni and Guy, I would use the spray for volume, my hair is very straight and it requires a lot of work to give it the some lift and body. I would love to win a gift card to Ulta so I can switch out some of my makeup for more organic and gluten free products. I would love to try the Classic Smoothing Lotion because I, of course, like to make my curly hair stick straight! I would love to try the Toni&Guy to add volume to my hair and would use the gift card to update my makeup bag. I would buy a dress! I wish my hair was shinier so I’d love to try a product that helped. I would use the hair products to prepare for a wedding I am in..and I would use the GC for Christmas gifts. I would love to try the Toni & Guy products to add volume to my hair. I would use the Ulta GC to buy some makeup. I would get an updated hair cut and use the Toni & Guy products to help maintain it. I would love to get a great new foundation at Ulta. I would use their products to give my flat hair some volume. I would use the gift card to purchase nail polish, eyeshadow and lip gloss! I would give this to my wife. She gets her hair done at the ULTA salon. I would use it to buy some new perfume, maybe Gucci! I’d use the Toni & Guy Prep Heat Protection Mist to protect my hair since I am always straightening it. I would get some makeup with the ULTA gift card!! I would give it all to my GF.